The Razer DeathAdder Essential Gaming Mouse (RZ01-02540100-R3M1) offers top-of-the-line performance for neophyte and veteran gamers who want all the fundamental, unadulterated, excellent features of the Razer DeathAdder series without any gimmicks spoiling the ergonomic design and bloating the price. Featuring a 6400DPI optical sensor, five Hyperesponse buttons, durable and responsive Razer mechanical switches (with up to a 10-million click lifespan), a gaming-grade tactile scroll wheel, and signature green Razer LED lighting, the Razer DeathAdder Essential is ready to serve as your go-to gaming mouse for everyday gaming. The equipped gaming sensor reliably translates every mouse movement, from tiny nudges to lightning-fast sweeps. The sensor has a maximum 6400DPI sensitivity and can track action up to 220IPS. It also comes with a fast 1000Hz ultra-polling rate. The Razer DeathAdder Essential Gaming Mouse may look modest and unassuming but packs a mighty punch when it comes to performance. Use it to play your favourite games and experience why the DeathAdder is a staple gaming mouse. 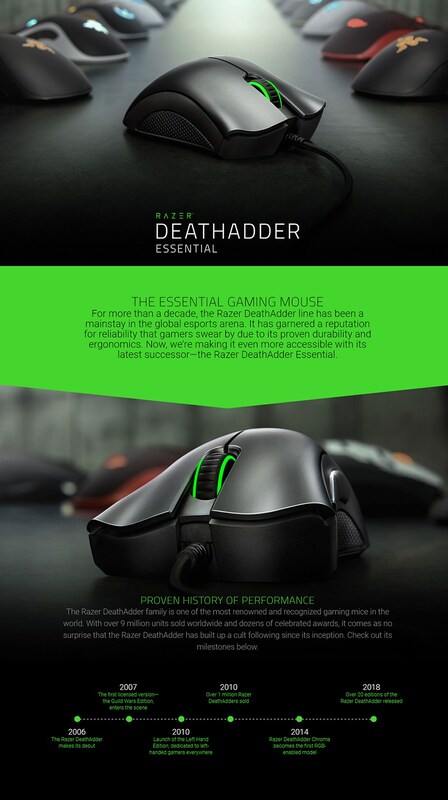 Read more about the Razer DeathAdder Essential Gaming Mouse on Razer's site HERE.